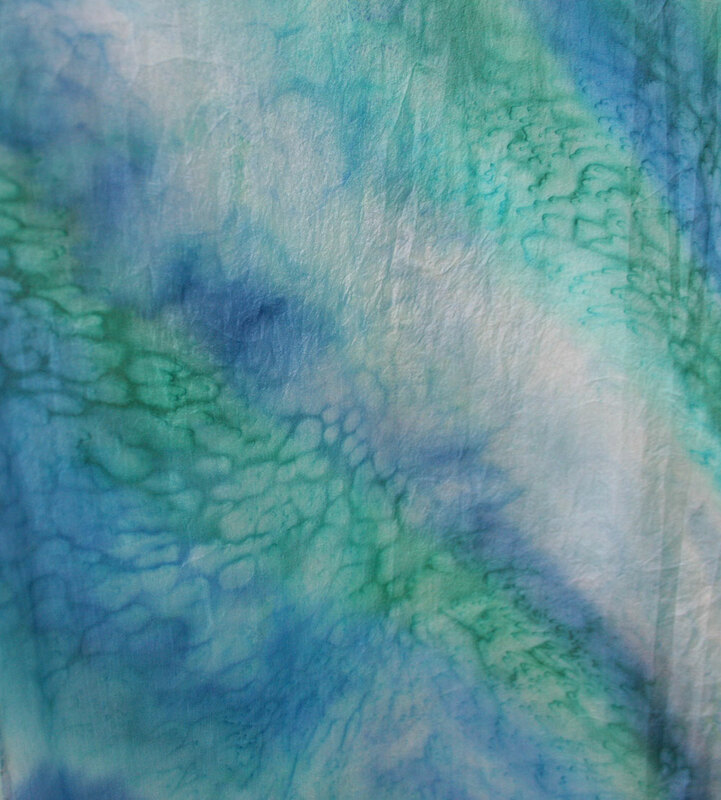 I got to play with silk dyes this week! So much fun now that I have a proper frame for stretching my silk. Hubby built me a simple frame out of 1×4’s with a 14″ x 72″ opening. 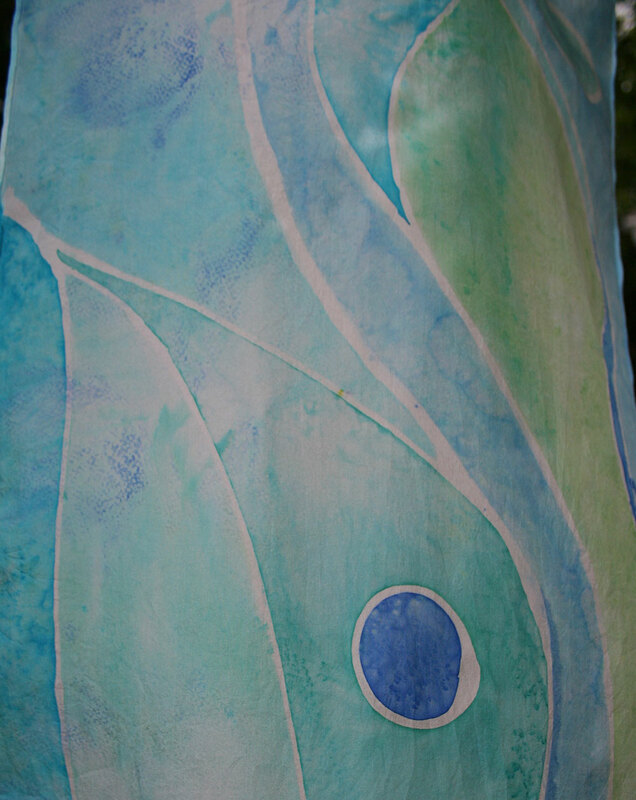 I tack damp silk in the opening, and I have a perfectly stretched canvas for silk painting. 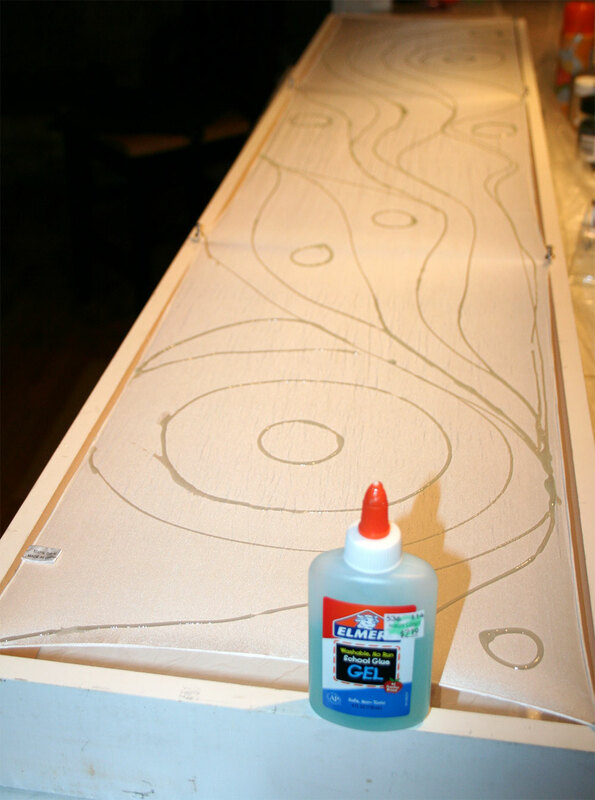 First, I used a favorite serti-resist method, with Elmer’s washable school glue. 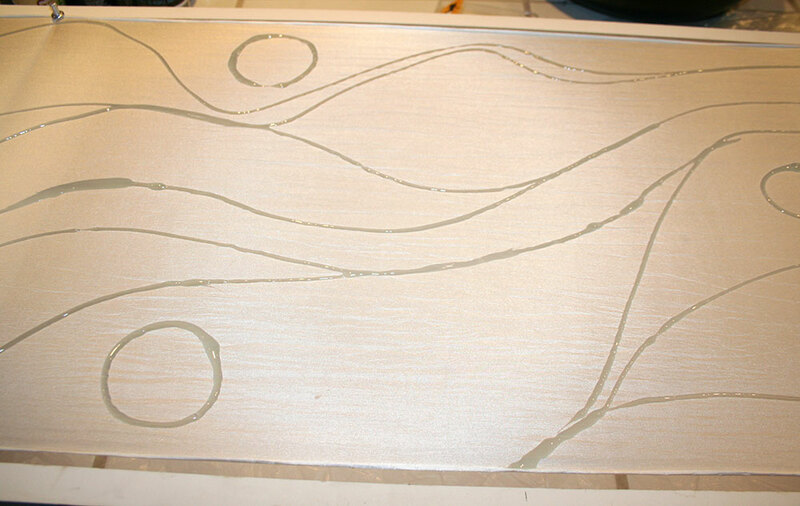 I drew lines and shapes with the glue directly onto the silk. After the glue was dry, I painted the spaces within the glue lines with Jacquard Green Label silk dyes. 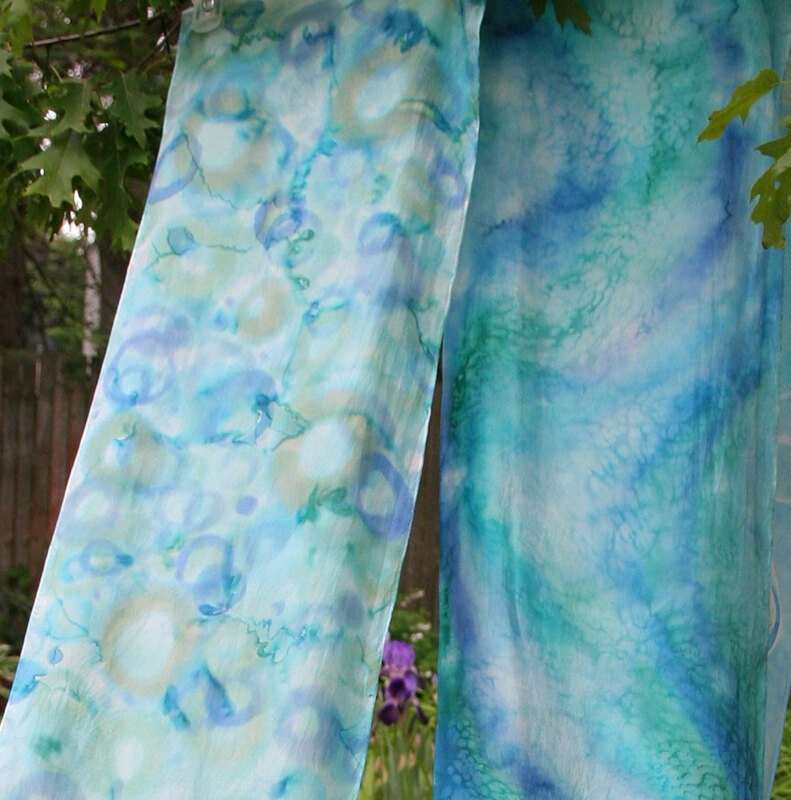 I love these dyes because they can be mixed and lightened with the addition of water. I also like the way they react to rock salt and rubbing alcohol to add texture to the surface. After letting the dye dry for 24 hours, I set the dye by steaming the scarf. I don’t have any special apparatus for this. I roll the scarf in blank newsprint and place it on a rack in my canning kettle above boiling water for 30 minutes. The glue can be rinsed out of the silk with a mild detergent (I use Woolite) and some mild scrubbing with an old soft toothbrush. It helps to let the scarf soak before scrubbing. Loving my new frame and too impatient to wait for glue to dry again, I dyed the next couple of scarves without a resist. For this one, I painted arcs of varying shades of blue and green. Then I sprinkled rock salt over the wet dye to pull the dye and form the interesting concentrations of dye. 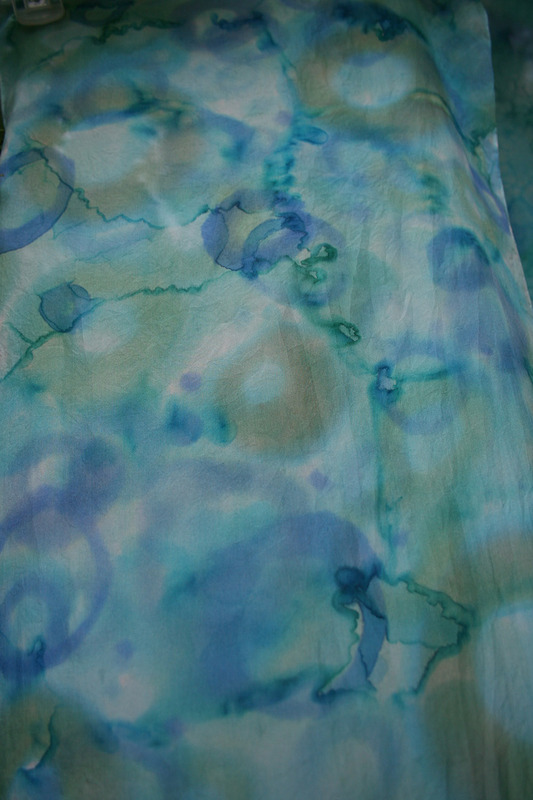 For this scarf, I relied on rubbing alcohol to help disperse the dye and form rings. For each ring, I dropped a 50% alcohol/water mix onto the silk, and then painted a circle around the drop. This kept the dye from filling in the circle. I covered the silk with circles in this manner and them the dye dry completely before adding another layer, then another, then another. So many beautiful scarves, so few days to wear them!